I get it to work fine with for instance the "hello_world_xml_dynamic" example. Then I can simply use the attached "USER_QOS_PROFILES.xml" . Is there something similair for the hello_idl exmaple? 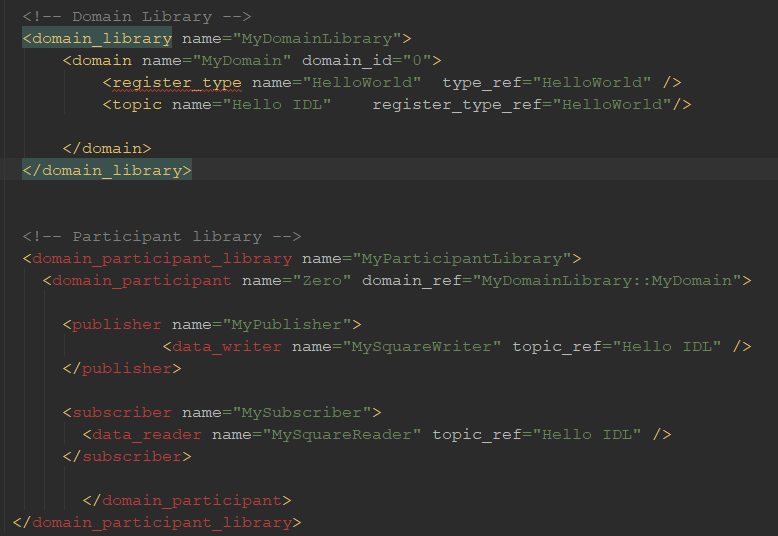 The "USER_QOS_PROFILES.xml" for the hello_idl examples, look totally different, and I can not find the relevant names. I could communicate a publisher running Java and a Subscriber running rticonnextdds-connector. Find attached the python subscriber and the XML configuration. Could you please try it and see if it is working? In the case that it is not working, please try to check with RTI Administration Console if the topics match or not. That worked perfectly. I am not so familiar with RTI DDS yet, but thank you for the tip about using the RTI Admin Console, that helped too.